Home » Retirement News » Aging in Place or Assisted Living Facility: Where do Retirees see Themselves Living? 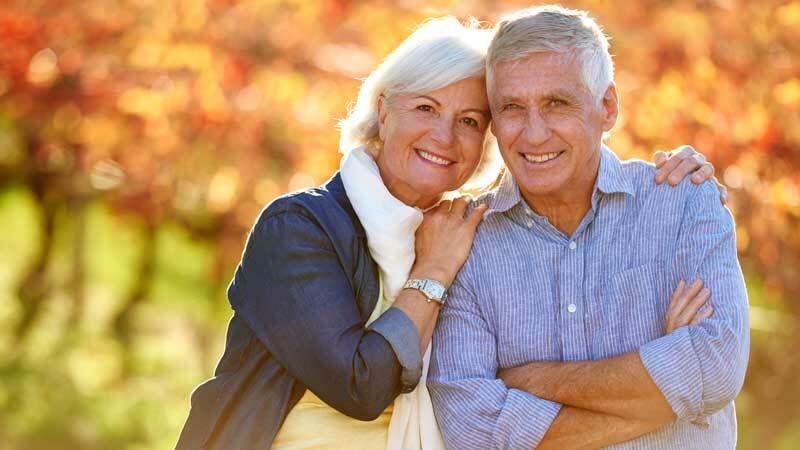 Just over 80 percent of respondents say they plan on living at home as they age. 75 percent of people said failing health is the leading push factor that would cause them to move into an assisted living facility, up about 25 percent from 10 years ago. The second biggest push factor is the loss of the ability to drive at 30 percent. Most people want to stay in their home or community because it’s near places they frequent (grocery stores, doctor’s offices, libraries, etc. ), with over 80 percent saying it’s important or extremely important. Conversely, many people don’t plan on having a job as they age with just over 56 percent of people saying it’s not at all important to be near work. Bathroom modifications are key for most people planning on aging in place with nearly 75 percent saying they will make some sort of modification to their bathroom; be it adding grab bars and non-slip mats or larger things like a walk-in tub. Just over 30 percent of people plan on making changes to the exterior of their home (wheelchair ramps, improved lighting) as needed. People are starting to think about and/or plan on using technology more to help them age in place (Up from 10 years ago). 53 percent of people say they are likely or very likely to use online pharmacies, while 40 percent say they are likely or very likely to use things like medical alert systems, ride-share apps (Uber, Lyft) and grocery/food delivery services (Peapod, UberEATS, etc.). When asked if they could no longer live on their own, 52 percent of people said they would rather live at home but with a part- or full-time caregiver over moving into an assisted living facility, moving in with friends or family or moving into a nursing home. Just over 30 percent said they would move into an assisted living facility, up 13 percent from 2016. We dug into the response data and found that while most people want to remain in their own home and community for as long as possible and are willing to use technology and home remodeling to do so, there are factors that would push them to move into an assisted living facility. Whatever stage in life you find yourself in, be sure to check out our aging in place resources and assisted living and home health care guides. Guides are broken down by city and state to help narrow down your search. 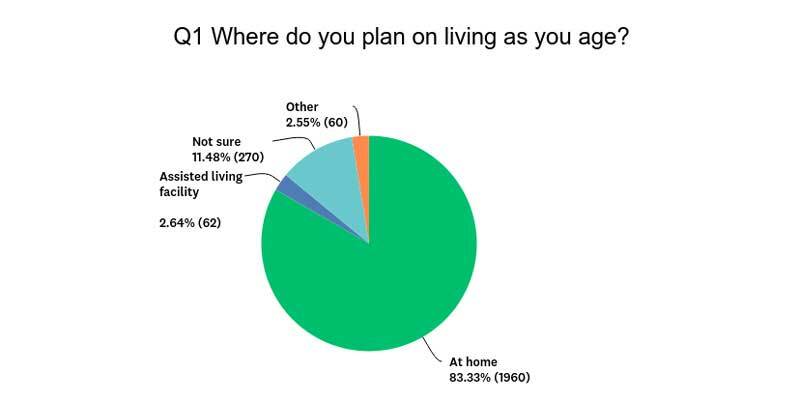 Analyzing the survey data for the question about where people plan on living as they age showed just over 83 percent of people plan on living at home followed by around 11 percent saying they’re not sure. A little more than two and a half percent of respondents (62 people) said they plan on living in an assisted living facility. It’s worth noting that assisted living facilities are less restrictive than nursing homes. Many assisted living facilities offer care on an “as-needed” basis but allow you to come and go as you please, while nursing homes focus on full-time medical-based care and come with less freedom. 1a. Most people want to stay in their home and community because it’s familiar. 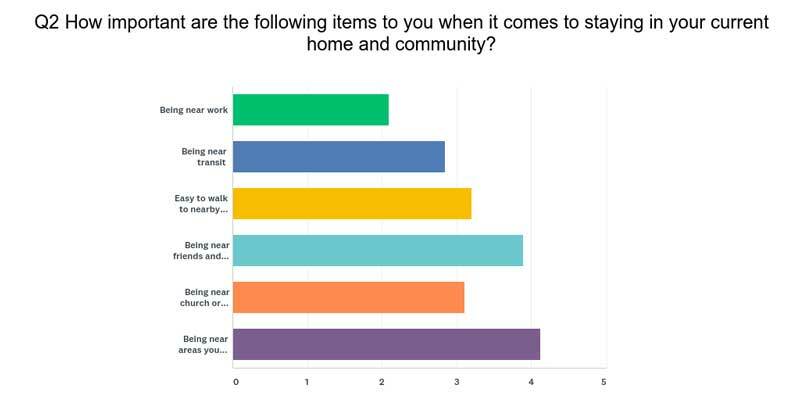 We asked how important six factors were when it comes to staying in your current home and community: being near work, being near transit, how easy it is to walk to nearby places, being near church or social organizations and being near areas you frequent (grocery store, doctor’s office, library, etc.). While the data shows most categories we asked about are important, being near work was not very important, showing most people don’t plan on working as they get older or don’t need to adjust their living situation based on a job. A little more than 80 percent of people said being near places they frequent like grocery stores and doctors offices were important to important, followed by being near friends and family (68 percent). Based on these results it seems the number of assisted living facilities in a community or close to a community where one lives might make the idea of transitioning into an assisted living community a little more attractive to people. 1b. Most people recognize the need for a little help when it comes to making aging in place safer and more convenient. When asked about what home modifications they plan on making to accommodate aging in place, nearly 75 percent of people plan on making some sort of modification to their bathroom. This could mean small changes like adding grab bars and non-slip mats or larger changes like installing a walk-in bathtub. 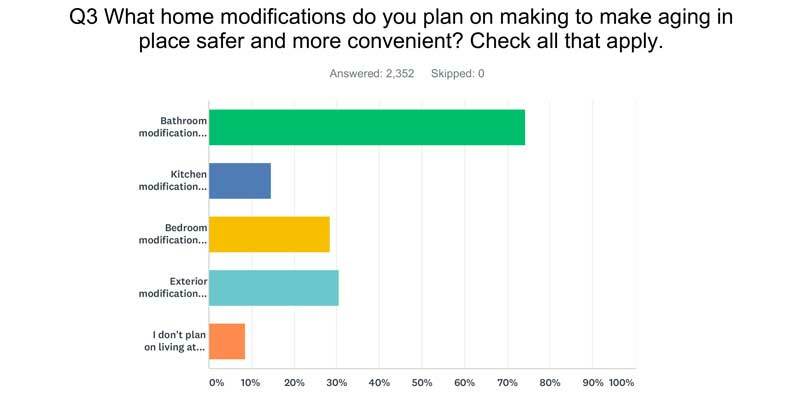 Around 30 percent of respondents also plan on making modifications to their bedroom and the exterior of their home, adding things like an adjustable bed, ramp access and improved interior and exterior lighting. It’s interesting to note around 200 of our 2,352 respondents don’t plan on making any home modifications as they age. 1c. Finally, we see that people are starting to consider the use of technology to make aging in place easier and more convenient. Overall the response data shows the majority of people still aren’t sure about using technology to help with aging in place with all but one category averaging in the “I don’t know” range. However, the trend leans slightly towards the “likely” and “very likely” categories as opposed to the opposite end of the scale. Of the six technologies we asked about: medical alert systems, grocery/food delivery services, ride-share apps (Uber, Lyft), activity monitoring systems, online pharmacies and stair lifts, most people either weren’t sure or were likely to use technology to help with aging in place. This shows an upward trend compared to 10 years ago when people weren’t sure and leaned towards not being likely to use technology. The chart below shows a snapshot of the upward trend. Survey data shows that having part- or full-time in-home care is preferable over moving into an assisted living facility if you could no longer take care of yourself. When asked what they would do if they could no longer live on their own, 52 percent of respondents said they would stay in their home and have a part- or full-time caregiver. Thirty percent said they would move into an assisted living facility, followed by wanting to move in with a family member (just over 16 percent) and moving into a nursing home (a little more than one and a half percent). We compared these numbers with a 2016 Pew Research Center study. Below is a side-by-side comparison of the two sets of data. When asked which factors would push them to move into an assisted living facility rather than age in place, nearly 75 percent of respondents said failing health would be the leading factor. This is still the same leading push factor from 10 years ago but up about 25 percent. The data shows the factors that have the most push are those that cause the individual to lose some form of independence. Following failing health, the loss of the ability to drive (almost 30 percent) and a financial crisis (just over 20 percent) are top factors that would cause someone to move into an assisted living facility. It’s important to note that loneliness may be a strong push factor for some, with 514 respondents saying the loss of a spouse or partner would cause them to move into an assisted living facility. It’s important for most people to remain in their current home and community as they age. This is because people like being near friends and family and areas they frequent like grocery stores, doctor’s offices, libraries, etc. The more assisted living facilities within a community may make the idea of moving a little more attractive. People plan on making home modifications to remain in their home as they age – mainly the bathroom. Installing things like grab bars, non-slip surfaces and walk-in tubs provide peace-of-mind for adults who are aging in place. Many people also said they plan on making bedroom modifications like adding an adjustable bed and exterior modifications like installing a ramp and better lighting to make aging in place easier. The use of technology to make aging in place easier seems to be playing more of a factor than it did 10 years ago. While most people are still unsure about how much they’ll use things like medical alert systems, meal/food delivery services and ride-share apps, the trend is leaning more towards the “likely” to “very likely” categories as opposed to “possibly” and “not at all” from 10 years ago. When asked if they could no longer live on their own, most people prefer to live in their current home and use home health care, either part- or full-time. However, they are more inclined to move into an assisted living facility now than in 2016 (up about 13 percent). Failing health continues to be the biggest push factor that would cause someone to move into an assisted living facility, followed by the loss of the ability to drive, a financial crisis and the loss of a spouse or partner. Retirement Living wanted to know where people plan on living as they age, how they’ll deal with challenges that come with aging in place and their views on living in an assisted living facility. The survey was created using multiple choice questions and questions using the Likert-scale format.